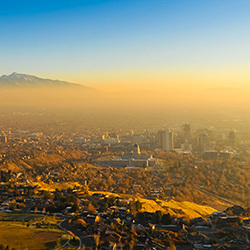 Utah is experiencing dangerous levels of ozone pollution—which can trigger asthma attacks and worsen emphysema. Utah's children and elderly are the most at risk. Which is why 3 out of 4 Utahns want stronger clean air rules—and the Utah Department of Environmental Quality (DEQ) is working to make that happen. They've released a proposal that, if strengthened and implemented, would modernize oversight of oil & gas pollution, reducing ozone-forming pollution and protecting the air you and your loved ones breathe. We need to make sure the strongest possible rules are finalized—but you only have a limited amount of time to speak out! Raise your voice today, before it's too late, and demand that Utah DEQ finalizing the strongest possible rules! I am writing today in strong support of modernizing Utah's oversight of oil and gas air emissions, but I also ask that you improve upon your proposal in the following ways: 1)	Require operators to check for gas leaks at least twice a year if not quarterly at all facilities. 2)	Apply these rules to all hydrocarbons that make up natural gas. 3)	Improve transparency by including reporting requirements. The ozone-causing pollution is putting Utahns--and especially our children and elderly--at risk. It can trigger asthma attacks and worsen emphysema. But it's also damaging our economy. Utah taxpayers lost over $31 million in royalties from 2009 to 2014 because of wasted natural gas on federal & tribal lands. The methane mitigation industry is growing, and other states are taking advantage. Our neighbors in Wyoming saw massive benefits when they implemented similar rules. Please be sure that when this proposal is finalized, the strongest possible rules are implemented.